Ah do you remember the days where songs had real meaning and dealt with the real issues, like Club Tropicana by Wham - before that song came out I was constantly worried that I wouldn't be able to suntan, or that there wouldn't be enough sunshine and fun for every one. 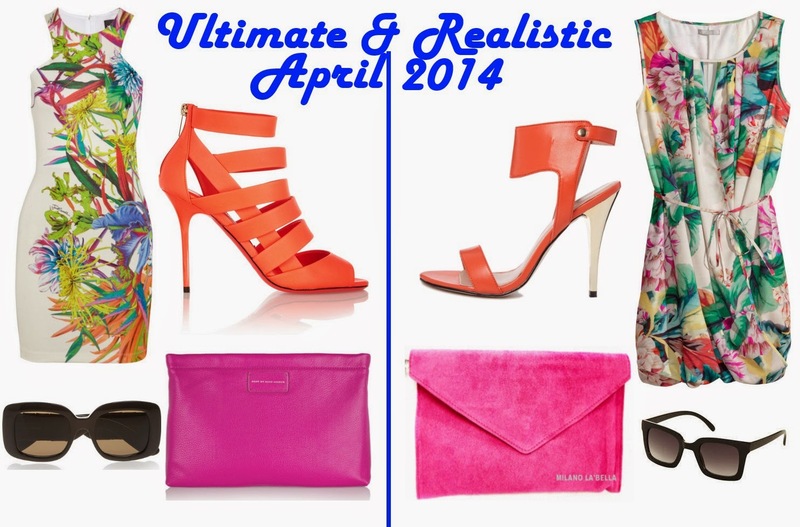 Yes for this months Ultimate & Realistic, we are heading off to Club Tropicana in homage to all the fabulous tropical prints that are flooding the high street, as well as being popular with high end designers. Juicy fruit prints, exotic animal prints, tropical floral prints...what would you choose? I think I would choose them all since I have been going wild on colour recently....seriously wild! Ultimate: Printed Stretch Mini Dress, Just Cavalli - £450; Damsen Neon Matte-Leather Sandals, Jimmy Choo - £625; Square Frame Acetate and Leather Sunglasses, Bottega Veneta - £695; Can't Clutch This Textured-Leather Clutch, Marc By Marc Jacobs - £245. Realistic: Draped Dress, H&M - £19.99; Carvela Jessica Ankle Cuff Heeled Sandals, ASOS - £68; Small Square Sunglasses, Topshop - £16; Hot Pink Suede Envelope Clutch, eBay - £17.90. I love the Just Cavalli dress, but £695 on sunglasses? You would have to be more mentally ill than me to pay that -especially if your likely to sit on them like I am. What do you think of tropical prints? I actually prefer the realistic dress and heels but the Marc by MJ clutch...SWOOOON. Tropical print is on my wish list this year! Love both dresses!